There was once a time when cellular phones were a thing only seen in the hands of high end business executives, VPs, CEOs etc. for they were that expensive. The scenario now though is a totally different one, with even toddlers becoming increasingly aware of the functionalities of a cell phone, probably even before they learn to walk or even talk! The Samsung Galaxy Y is the one of the latest of the Galaxy series of phones from the house of Samsung catering to such a generation and is considered an entry level smartphone but promises a power-packed package nonetheless. Another phone riding the wave of popularity of Google’s open source phone operating system (OS) platform Android, the Samsung Galaxy Y runs the Android Gingerbread v2.3.5 OS and Samsung’s trademark user interface (UI) TouchWiz offering an almost effortless way of surfing through the phone. At the heart of the machine is a reasonably powerful 832MHz ARMv6 processor which enables smooth phone operation. The 2MP camera on the back, manages to take good images, plenty of which can be stored on the phone’s external memory card which can be expanded up to 32GB. The phone runs on a Li-on 1200 mAh battery. The phone comes ready with Wi-Fi and a hotspot functionality to hook onto Wi-Fi networks, and is preloaded with apps like Google Maps, document viewer and music player which supports all the popular music formats like MP3, WAV, AAC, eAAC+ to complete the multimedia platter. The phone is HSDPA network ready. And being 3G ready along with the Wi-Fi enabled, the users are left wanting for more battery life than on offer. But all in all, the phone is a good first choice for a youngster’s multimedia needs. And being available in some handsome deals, this offering from Samsung makes it an almost tailor-made phone for the youngsters. With so many features to look up to definitely this mobile phone makes up to one of the most top notch choices to be chosen when it comes for phone. Available on the online platform, this phone is easy to transact and a perfect way to communicate daily. 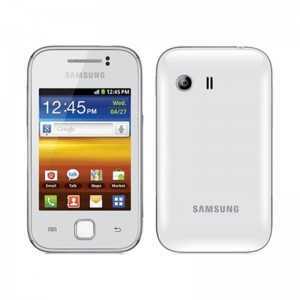 The Samsung Galaxy Y is one of Samsung’s latest Mobile phones in the Galaxy series which are targeting the youth market. Equipped with a 2MP back camera and Android Gingerbread v2.3.5 and full multimedia capability, all running on an 832 MHz processor, making this is a perfect phone for the tech-savvy youth of the present age.